I got some photos of a quilt top made in Alabama in the 1930s or '40s asking for help with pattern identification. I recognized it immediately as one of the most complex designs from the newspaper pattern source that used the names Laura Wheeler/Alice Brooks. It's number 1515 in my Encyclopedia of Pieced Quilt Patterns with the name "Snowball Wreath." The quilt in question is appliqued with leaves tucked behind the pieced snowballs but the original pattern is designed to be all pieced. You can find it in BlockBase, the computer program that is a digitization of my Encyclopedia. Here's the drawing from BlockBase. You can print out templates, any size. It's always fun to see if any of the audience for the newspaper patterns ever made up the designs. I don't recall seeing this one actually made into a quilt. If you are inspired send me a picture. I love those fabrics in the photo! Love the quilt...but don't think I could piece this! Looks like you could piece all except 4 of the circles...I think they would have to be appliqued. Love your blog! Enjoy reading it daily. Well Alice Brooks who probably never pieced a quilt in her life thought one could piece this. I made one snowball wreath block this weekend. I bought Blockbase first and decided on a 12" block. I'm planning to made several more, each with different fabrics for the snowballs. I realize it is has been awhile since you posted this post about the Snowball Wreath pattern. I agree that Laura Wheeler could not have made this block/quilt (setting aside the fact that she is fictional). 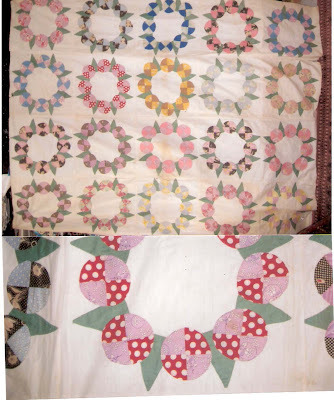 this block came up on my blog again recently and I did a Google search to see if any new/vintage quilts had come to light since I wrote about it last (http://www.artquiltmaker.com/blog/2007/06/snowball-wreath/). I was pleased to see your posts and get links to those who had tried the block. I didn't get many takers, but you can see my efforts on my blog. I am thinking about trying it again, perhaps getting some rotary cutting templates made and seeing how that works. I am sorely tempted to use the original shapes, though they are weird, just to see if the block can be made with them.